Until August 10: GOYA AND GUIDO RENI: ART TREASURES. PALP (Palazzo Pretorio, Corso G. Matteotti (Piazza Curtatone e Montanara), Pontedera. Open Tuesday through Sunday 5 – 11 pm. Free admission. The first painting in the showcase, “Young Self-Portrait” dates back to 1771, during his twelve-year stay in Rome. Scholars assume the work was created when the artist was 25 years old, while he was studying with Pompeo Batoni. In the 19th century the work was poorly restored, hiding the qualities of the paintings. Now properly cleaned, this masterpiece reveals significant information about Goya’s personal history and temperament at the time, and so detailed that it almost appears sculpted. Coming from the City Art Museum of St. Louis, the painting will be transferred to Saint Petersburg after its stay in Pontedera. Complementing “Young Self-Portrait,” a second “Self-Portrait” (1782) hangs in the second room of the exhibition. Recently discovered from a prestigious private collection, the painting was unrecognizable prior to a successful restoration. After significant work to recover the painting from a faulty restoration, the famous signature of Goya, written in red, appeared as a surprise. Juxtaposed with his earlier painting, this work reveals the effects of time on the face of the artist. He appears more self-confident, mature, and his face more drawn. Multiple analyses of this portrait, using XRF testing and infrared reflectography, are displayed to demonstrate the subtleties of the painting revealed by scientific analysis. 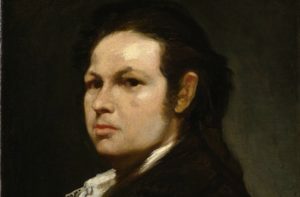 This process provides a deeper understanding of Goya’s artistic choices: pigments, materials, and methods used during the creation of the piece. In the third, and final, room, a singular painting by Guido Reni commands the space. Entitled, “Susanna and the Elders,” the work belongs to a collection of his unfinished works, and features the same subject as his other works residing in the National Gallery of London. After significant analysis of its color and brushstrokes, art historians attribute this piece to Reni’s final phase of his career.